Say hello to Amanda from Hooray House Studio. She is a brand strategist and is here to share with you her top tips to brand your Instagram page. Are you currently struggling with your Instagram? Are you wondering what to post, how to make your feed cohesive, or how to grow and retain followers? Well, I have a fantastic solution for your Instagram stress: BRAND STRATEGY! As a brand strategist I help individuals and businesses create online identities. Specifically clear, cohesive, and memorable identities with purpose and function. It helps you make creative decisions that will best support the experience you want to offer and encourage the feelings you wish to evoke from your audience. It helps you write and shoot content that your audience will find relevant and valuable which keeps them coming back for more! The first thing you need to understand (no matter if you’re an individual person looking to break into blogging and influencing, or if you’re a business looking to generate leads or funnel sales) is that ALL social media content including Instagram is MARKETING. Marketing requires research and strategy. Every post you create should be helping you work toward achieving your goals. If you’re just guessing or throwing lots of content at your audience until something sticks you will not only have a really confused audience, but it will also be harder to get them to stick around long term. To help you build a structurally sound creative direction that your audience will find especially captivating. To help you stand out from other people or businesses in the same industry covering similar topics. To enhance the experience your audience has when consuming your content, so that they remember you and refer you to others. To help you get CRYSTAL CLEAR on what you stand for, what you offer, and why your audience needs you in their life. I’d like to stress that this is not about having a perfectly curated and styled feed. We want to create human and relatable experiences, which means embracing imperfection with a heavy focus on communicating better. Whether you know it or not every post you create is SAYING SOMETHING, no matter if you write a caption or not. We’re visual people, which is why Instagram is so popular to begin with. We rely on our photo content to be stimulating and alluring, otherwise no one even gets to reading the caption or visiting our profile to see what we’re about, and if they don’t find our photos interesting, they will scroll right by. Now, usually social media content is the 4th step in brand creation with brand strategy coming first, designing your logo and website coming next, and then making a social media strategy. Today, we’re going to jump right into how to drastically improve your Instagram effectiveness ASAP. Below are the exact questions I ask my client’s when we’re developing their Instagram content. 1. Why does it look the way it does? It’s important to select styles and colors based on the virtual atmosphere you want to build. Think of your Instagram feed as an online interior design. Think about how certain spaces can cause you to feel and even act differently. How does your feed look currently? Did you build it more for you and your personal preferences? How useful and engaging is your content? 2. What kind of first impression are you making? If your Instagram feed is cluttered and visually inconsistent you run the risk of over stimulating and overwhelming your audience. If there’s no flow and they just can’t figure out what to focus on first, there’s a high chance that they won’t stick around to learn more about you. 3. How do you want to make people feel? I think we are all in the business of making people feel good. However, you will be extra memorable when you can resonate with someone on a deeper level than that. How can you take those specific descriptive emotions and apply that to something visual with a valuable message? Then the atmosphere starts to take shape. 4. What is your audience currently loving? You should ALWAYS have your hand on the pulse of your audience. They are telling you what they love. I always like to explore the numbers (your analytics). I look at the best performing content and what people loved about it, so I can duplicate that in the future. It also doesn’t hurt to reach out and ask them what they want to see more of. What ideas and core principles are you looking to spread far and wide? Branding is a lot about repetition and reputation, and building both together. Write down three of the most important topics you want to be known for and continuously infuse them into your content. 6. What is your value? What does your audience get from you that keeps them coming back? For example, this blog post that you’re reading is MY value. It’s hard for me to sell brand strategy without blogs and Instagram content that share information and educate my audience on the importance of my services. And it’s always a fantastic idea to create a few benefit driven headlines that efficiently explain what your audience will find on your account and include that in your profile. Where do want to be in a month? Three months? Six months? A year? Know where you’re going, so that your content can help you get there. 8. What about your content isn’t human? I know that sounds like a weird question, but you’re not a robot, so don’t post like one! The biggest mistake I see people making is just posting the highlight reel, or just posting their finished product. I call these accounts portfolio accounts (photographers, I’m looking at you). You have to create at least SOME documentary style content that goes behind the scenes and showcases the less glamorous side of your work. You need to be relatable, and that means posting photos of yourself, your workspace, your tools, and your work beyond the finished product. Instagram stories is a great place for video content that gives your audience a peek inside your daily life. Instagram also offers the albums feature where you can upload several photos in one post. If you want people to get invested in your story and support your goals you will have to touch base with them, and show up in many different ways. There it is! 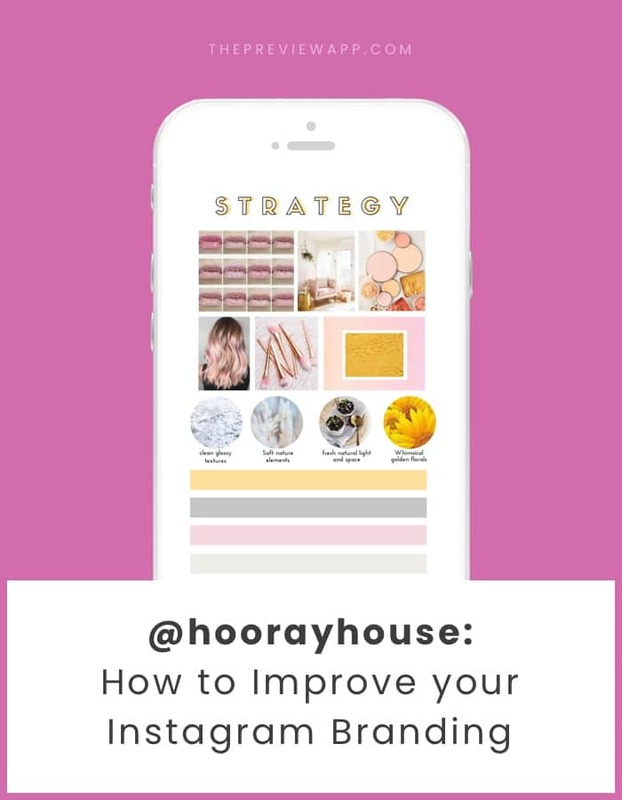 Instagram is an incredible platform to market yourself or your business, but you should always make sure you have a plan. Brand strategy helps that plan come together so that you’re never stuck wondering what to post, or how to build your following.